Scorpions are very distinctive arthropods. Their large pinchers are used for climbing, holding prey, defense, or courtship and mating. The stinger, located at the end of the long narrow tail, is used for defense or to kill prey. Scorpions feed on a wide range of small animals including crickets, spiders, caterpillars, and centipedes. They have very poor vision so they often lie in wait for prey, grabbing anything that wanders into their area. Development from birth to the adult stage may take more than a year. Mature individuals, up to 2-5/8 inches long, may live for another 2 years. Southern devil scorpions are usually found around rocky hillsides. Crumbling rock faces, brick walls, crawl spaces, leaf-covered areas, and log piles are favorite habitats. 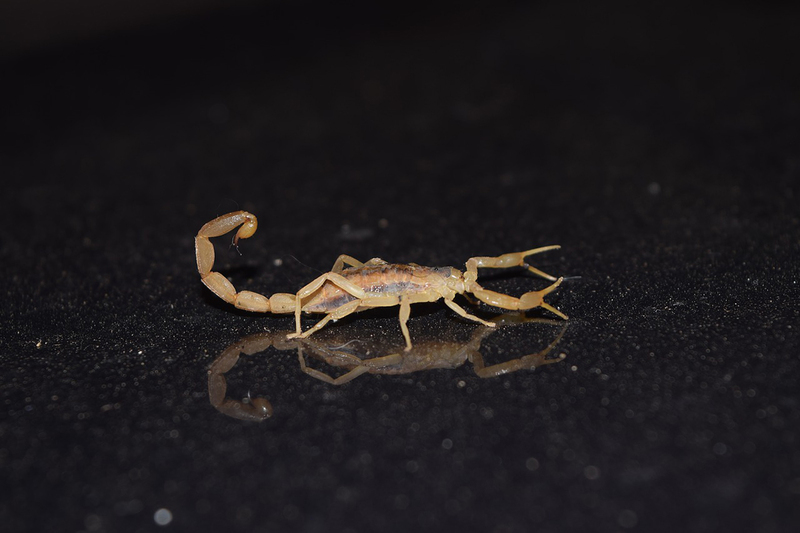 Scorpions are most likely to be seen in or around houses from April through June but can be active until fall. Dense ground cover, such as leaf litter or mulches, tall grass, wood piles, or general clutter provide excellent protection for scorpions and the small creatures that they eat. Scorpions can be accidental invaders in homes and buildings where they may crawl into or under any object that affords some protection. Gaps around doors are a major entry way for these wandering hunters. Prevent entry by sealing and weather stripping around thresholds and plug gaps where utilities (wire and pipes) enter the structure. Then follow up with a major cleanup to eliminate as many of the hiding places as possible that are so important for scorpions and their prey.